An original manuscript and sketches uncovered in the La Jolla, California, home of Dr. Seuss (Ted Geisel) will be published posthumously as a new picture book by Random House Children’s Books on July 28. The text and near-complete illustrations for What Pet Should I Get? were set aside by Geisel’s widow Audrey in 1991, and rediscovered among other materials in fall 2013. The remaining work will result in at least two additional forthcoming Dr. Seuss books. The project will be overseen by Geisel’s former art director, Random House Books for Young Readers vice-president and associate publishing director Cathy Goldsmith. In a press release, Goldsmith says that What Pet Should I Get? is believed to have been written between 1958 and 1962, as the brother-sister protagonists also appear in Geisel’s 1960 title One Fish Two Fish Red Fish Blue Fish. While undeniably special, it is not surprising to me that we found this because Ted always worked on multiple projects and started new things all the time – he was constantly writing and drawing and coming up with ideas for new stories. It is especially heartwarming for me as this year also marks twenty-five years since the publication of the last book of Ted’s career, Oh, the Places You’ll Go! All rediscovered drafts will be kept with the rest of the Dr. Seuss collection in University of California, San Diego’s Geisel Library. 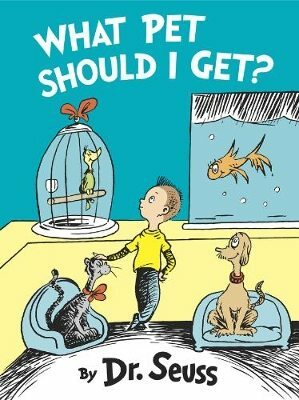 Tagged with: Dr. Seuss, What Pet Should I Get?